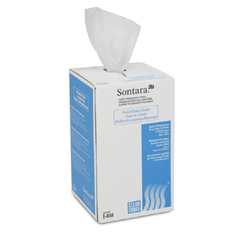 Our product range includes a wide range of sontara fabrics. No chemical treatment or binders are used to manufacture these Sontara Fabrics. This is a polyester nonwoven fabric, made by Dupont by hydro entangling technology. In this process, the jets of filtered, high-pressure water are continuously used to wash the fabric during manufacturing. These are ideal for cleanroom environment, where reduction in particle contamination is of paramount importance. These fabrics contain low extractable level and ion content as well as extremely low particle generation.